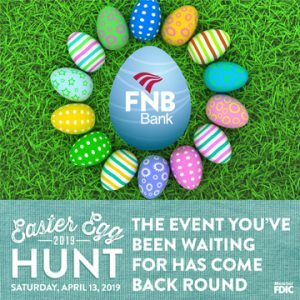 The fun, giveaways and excitement of FNB’s 12th Annual Easter Egg Hunt is finally here. Join us on Saturday, April 13th for the fun you’ve been waiting for all year! Registration and Easter Bunny Pictures will be held from 9:00 to 10:45 a.m. at FNB Bank’s Main Office, located at 101 East Broadway in Mayfield. 0-2 Age Group: Hunt will begin at 11 a.m. on the Mayfield Main Office Back Lawn. 3-4 Age Group: Hunt will immediately follow the 0-2 age group hunt on the Mayfield Main Office Back Lawn. 5-7 Age Group: Hunt will immediately follow the 3-4 age group on the lot off of North Street directly behind the Mayfield Main Office. 8-10 Age Group: Hunt will immediately follow the 5-7 age group on the lot off of North Street directly behind the Mayfield Main Office. In the event of rain, the hunts will be moved indoors at the Mayfield Main Office. Please contact FNB Bank at (270) 247-1758 or by emailing us at events@growwithfnb.com if you have any questions. To stay up-to-date with all of the exciting details follow our event page on Facebook at: https://www.facebook.com/events/391996474684335/. We hope to see you there!